Mio Sugita (杉田水脈) is a member of Japanese House of Representative and a comfort women denier. Before joining LDP in late 2017, Sugita visited California in December 2013 as part of the three-member delegation of Japan Restoration Party (日本維新の会), which later became the Party for Japanese Kokoro (日本のこころを大切にする党). While there, Sugita and her colleagues met with local Japanese American leaders who had endorsed the comfort women memorial in Glendale. Failing to convince them that the history of comfort women was fabricated, she later dismissed the Japanese Americans as “typical left-wing extremists” in an interview with a Japanese publication. Since losing her re-election in December 2014, Sugita traveled around the world extensively to promote comfort women denial at the United Nations level, speaking at the United Nations Human Rights Council (2015) and at the UN Commission on the Status of Women NGO Parallel Events (2016) along with people like Shunichi Fujiki, Koichi Mera, and Kiyoshi Hosoya. She also participated in Alliance for Truth about Comfort Women Geneva Delegation (June 2017). 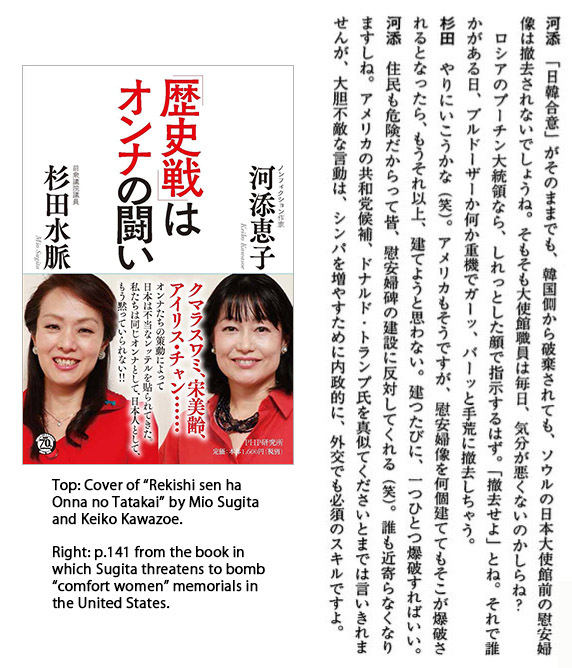 In the book “Women Fight the History War” (Rekishisen ha onna no tatakai), co-authored with non-fiction writer Keiko Kawasoe, Sugita proposes bombing comfort women memorials in the U.S. When asked if she was encouraging terrorism, she responded that she would leave the interpretation to the readers. Sugita joined the board of Japanese Society for History Textbook Reform, a historical revisionist organization in 2017. In the October 2017 election, Sugita ran for Shugiin (House of Representatives) from the Liberal Democratic Party at the urging of Yoshiko Sakurai and won.